Tony was born on 13 December 1932 in one of three farm cottages in Hauxton. His maternal grandparents, William and Mary Bye, lived in one of the other cottages; his grandfather worked on the farm. Tony’s parents moved from Hauxton to a thatched cottage in Harston in a lane known as Sheepshead Row. This became the Avenue and is now called Sheepshead Lane (next to the BP garage). 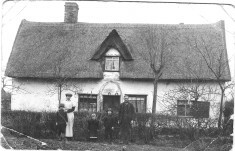 Tony’s father later bought another thatched cottage opposite the Village Hall and his maternal grandparents moved into the Sheepshead Lane cottage. Tony’s parents eventually had six children three boys and three girls, Tony being the eldest. When Tony was about 17 the family moved to 161 High Street, which had orchards behind. They also bought land from the Hurrells to expand the orchards. Tony’s mother also owned the bungalow opposite. When Tony was about 21 the cottages in Sheepshead Row (The Avenue) were demolished. Tony went to school in Harston along with Gerald Ives and Val Joslin (who was here as an evacuee) – both still live in the village. The headmaster was George Royston who lived in the house next to the school. Main memories of Mr Royston are that he kept ducks and he was a kind man but he was free and easy with the cane. Miss Ashby was one of the teachers. There were many evacuees from London during the war. Housing of the evacuees was managed by a Mrs Bisseker who lived in the large house (The Old House no 25 High St). They were lodged in twos with different families. He remembers Roy Rix and Alan Souter. The school was very crowded but all the children got on well together. There was a woodwork room in the school. Tony belonged to Harston Cubs which met in the field behind Harston House, where Stockers car sales now is. Tony was invested by Lord Baden Powell. There used be a lot of agriculture and fruit growing in the village. As children Tony and Gerald Ives used to help the Hayes family with the harvest, Gerald used to load horse driven carts with sheaves of corn and they would then lead the carts along the road. Tony remembers, after the war, the cattle from Baggot Hall being driven to graze on the Button End meadows. Farmer Crow also put cattle there. Tony and Gerald used to help drive cows and pigs from Baggot Hall to Button End. (across the A10!). Tony also used to help his grandad cart sugar beet to Harston Station where it was loaded onto railway trucks in the sidings where the builders yard now is. While living in The Avenue Tony’s father bought 7 acres of land in Button End quite early on, off the Wisbeys, where he now lives in Parkfield. They kept pigs and about 2000 chickens. They also grew vegetables and flowers. His family farmed land by Fleece Cottage in his teens near Bert Northrop who lived at Fleece Cottage. As a boy Tony used to have to get water from the Button End ditch artesian water source by Greystones and use a lantern as there was no electricity. To the south of the Gatwards Button End (Parkfields) plot were allotments rented out by the Rowleys in the 1940s/50s. The Gatwards had a large allotment plot (1/4 acre) then Mr Warren had it (Pest control Stibbings’ wife’s father was a Warren) but many others had smaller ones (10 poles). Alan Farrington, who lived near the Church St surgery (as did his grandparents), managed the lettings for the Rowleys, even after the manor was sold. This field is now a pasture in 2016. Some of the allotment users were Bill Stitlle, Tom Starr, ? Northrop, Stan Cox. At the end of Button End, on the eastside, were another set of allotments that are now just part of the field. The Gatwards used to grow barley at the back where the Parkfield caravan site is now. Tony’s dad used to take a van and collect produce from all round Cambridge to take to London. They took their own beetroot, carrots, spring onions, flowers, etc. Some Jewish boys had originally come from London to pick up the produce but when they retired Tony’s dad took it on. He would deliver to different places on the way to London, such as Ware. Some produce he took to a Nursing Home on Brooklands Avenue. Across the road from that was Portadges? and he got a lot of produce from there to take. All around the outside of the Button End smallholding were (green)gages which formed a windbreak and made the most use of the land. They also grew a variety of apples; King of the Pippin, Cox Golden Orange Pippin, Lanes Prince Albert cooking apple, Russetts, Ann Elizabeths, Bramleys and Newton Wonders. The Gatwards had 10 acres of orchards behind the High St houses. The orchards at Monrovia, 161 High St, were there before Tony was born in 1932. Tony’s granddad Bye lived with them there and was still picking plums in the orchards when he was 87. They had Belle de Vanes plums, Cricks yellow plums, Damsons, Victoria Plums, English gages and lots of eating apple trees such as James Greeves & Charles Rees. Blenheims were picked late to give apples near Christmas time. At 159? High St Mr Ranyards had orchards, and the Gatwards orchards went up to hill Top Farm. Michelles owned the orchard (gone by 1971) to the east of the White House/Hill Top Farm. Jim Wick also had a garden with an orchard, as did the Thodays. Thodays had the biggest bit of land. He left it to Eddy Mead who changed his name to Thoday. He moved to the Isle of Wight. In the Avenue were Kenzies, Kendons, Charlie Rogers (son of Rogers on Newton hill) and they all had grounds with orchards. Frank Swan had a big orchard at the back of his garden and also kept chickens. Tony bought a trailer off him. The Gatwards used to send the apples to Scotland (by train) and London from Harston Station.. ‘Specials’ trains from Harston Station took greengages on Sunday Mornings to markets.To the east of Beech farm lived the Hopkins family who used to run lorries to Covent Garden and Spittlefields, taking the produce in big round baskets. During the war the orchards were getting run down and overgrown so POW were brought round in lorries and they used to cut the undergrowth down. The Gatwards decided to remove the orchards once they proved unprofitable (sometime after Tony’s grandad died in 1959; orchards were still shown on 1971 map). Once they sent 2 tonnes of greengages to Scotland for sale and didn’t receive a penny – may not have sold or cost of transport took money. Tony himself dug up several acres. The remainder were dug up by Pearce and Sons (Pearsons?) at a later date. They had a big machine that lifted the trees and their roots out of the ground. They removed the north side first, then next to Hill Top Farm. In his teens Tony farmed 5 acres, owned by Col Hurrell, to the south of Hill Top Farm where he grew potatoes, corn/barley. He had a machine on the back of the tractor that set two rows of potatoes at a time. This field could be reached from the Avenue (Sheepshead Lane) where his family lived originally. Tony knew the two ladies who had the Hill Top Farm, then Col James who bought it who had horses that his daughter and Tony rode. At one point Tony worked at Davis’s/now Scotsdales and learnt about bulbs there. Tony also worked at weekends at Baggot Hall Farm and would join other labourers who met at the wall opposite the Pemberton Arms at 7am, before cycling up to Baggot Hall to work. He earned 10 shillings for Sat/Sunday. They used the entrance to the farm nearest the Station. Some of the workers were Arthur & Bill Stittle, Tom Starr and Jean Sewell (who lived in River Farm, Haslingfield where there were Strawberry fields growing for Chivers). Jack(Harold) Shipp had driven pony and trap milk carts originally, then they got mechanised milk carts- very posh at the time. Lou Rogers also did the round as did Gerald Ives for a few years. There were two milk rounds,one via Newton, that met at Manor Close. When Tony was about 6/7 the Hays had Suffolk Punches to pull the machinery (Chivers River Farm had Percherons). They used to keep the horse at Baggot Hall and Eileen Hays had her riding school there. The threshing drums had Lister engines (made in Cambridge) that went all day long, the elevators taking the sheaves up to the Stacks. They put as many stacks as possible behind Hays farm, in a stackyard, and some was left half way up Newton Hill for threshing. Tony worked for Warboys contractors on threshing for over 6 months, carefully cutting the string that held the sheaves so the sheaves dropped off his hand onto the machine while the string remained behind on his hand. Tom Starr would load the carts with the sheaves in a special way. All the Hays daughters worked there on the farm and had horse rakes behind the tractors picking up any loose stuff. You could get 10 comb? an acre. It was a longer straw then so you could thatch with it. Tom Hays had a house built in an orchard (now Orchard Close) but after his father died he moved into Baggott Hall farm and his sister/s moved into his house- called Pheasant Rise or Woodcote. The High St end of the plot he had as allotments- possibly for his workers to rent. His brother Bill had a house on the opposite side of the High Street that used to be the Pasks. Harry Wisby ran Fountain Farm in Church St and people would visit to buy certain amounts of grain for chicken feed. Harry’s land went behind the house and through the orchards, where Pightle Close now is, up to the Queen’s Head and rented more land off the Manor where the big houses on Mill Rd have now been built – about 15 acres in all. Harry Wisby’s brother used to farm some of Jesus College land, late 30s/40s?, and the Hays had land up to Rectory farm. Stevens ran Rectory farm then and the farm opposite Manor Farm in the south called Bedstead farm, owned by the University. Dennis Chapman and George Lacey farmed some land next to Old English Gentleman. Tom Jackson had a little farm place on London Rd (where The Chestnuts now are) where he also had a small coalyard. (Trains brought in coal and took out fruit). He had a wooden type barn there but had land east of Dr Townley’s house to the east of London Rd to keep his horses on. He later bought a small farm- Hill Farm on road to Newton (from London Rd). Jacksons had a piggery but sold it off. Sutton’s next door to it had a big wood yard there, and parked lorries there. They kept the wood for 6 years before cutting it. Rodwells (who owned the farm in Hauxton where Tony was born) had the Lime Tree Farm land (later the Limes) in Harston. They were also agricultural contractors and used to have threshing machines and drums with which they used to go round the villages and thresh the stacks/stooks/shocks/ that the farms had stacked on their own land. Tony can remember when 8 yard headlands were left to allow for the plough or thresher to turn/lift and that men cut the corn by hand with a scythe around the edges where the machines couldn’t reach. Tony helped out at Trigg farm (opposite the Pemberton Arms) with the harvesting when young, about 10-12, with his grandfather James William Bye and Sid Sutton. There is a photo taken of them while Tony had gone home for a quick (10 minute) lunch. His grandfather had another job in charge of cattle near Hauxton Pits. Tony helped out on other farms when young, before and after school to earn money. He helped ‘single’ out the beet- separate the clumps so only one beet remained to grow large. South of the allotments, where Centenary works now are, was a smallholding with lots of sheds – run by Mr & Mrs Porter. On the east side of Button End opposite Linden Lea were gravel pits dug out by Judes of Haslingfield. (He had the first grey Ferguson ever to come down here). Tony as a child would look at the sandmartins in the walls of the pit which was filled in later by Mr Pearce. Mr Baker, who lived next door to the pit land bought it cheap. It was backfilled (about time Tony was in his teens).This land came up to Tony’s. The industrial estate gravel pits were worked by the Haslingfield Wisbys. They had ‘U’ shaped wagons, _which could tip two ways, and carry about a ton of sand/gravel, running on rail lines that came up out of the pit. After the gravel works were finished there (1940s?) Jean (nee Wisby) and husband Peter Rowell made concrete lintels there. Camtiles used another part of the land to produce tiles. Wisbys still owned the pits land. They tried to get permission to build houses there but were not allowed to. Stan Wisby &and his wife lived near 150 High St, near the car showrooms. Arthur Wisby lived in Green Man Lane where Mumford’s place was. The Wisby builders built Gerald Ives house in Button End in 1937/9. Where Tony lives now at Parkfield, he used to make roof tile and run a Tiling Factory when he was about 18-21, before going in the army at 24- 1956/7. When he was 24 Tony did national service with the Suffolk Regiment in Bury St Edmunds. During this time he met his wife Angeline, who lived in Haverhill, and they married when he was demobbed in 1959, age 27. He and Angelina lived in a caravan next door/to the right of Parkfield. Tony has been married to Angeline for 55years. They lived in Springdean for 53 years, one of a pair of bungalows built by the Gatwards on the left at the end of Button End. They then converted an old barn next to the bungalows and they now live there. They also own land on the right hand side of Button End which goes behind the other houses and contains a County Wildlife Site where Angeline thinks there may be Great Crested Newts. There used to be piggeries behind Parkfield and Springdean but the land is now used for a Caravan Club site which Tony runs. Harston was busy with Canadian, Australian and other nationality soldiers waiting to be sent on postings. The Village Hall was taken over by the military and was used as a canteen and ENSA concerts were held there. Hooks in ceiling of the Village Hall were probably for scouts gym training but may have been used for army training. 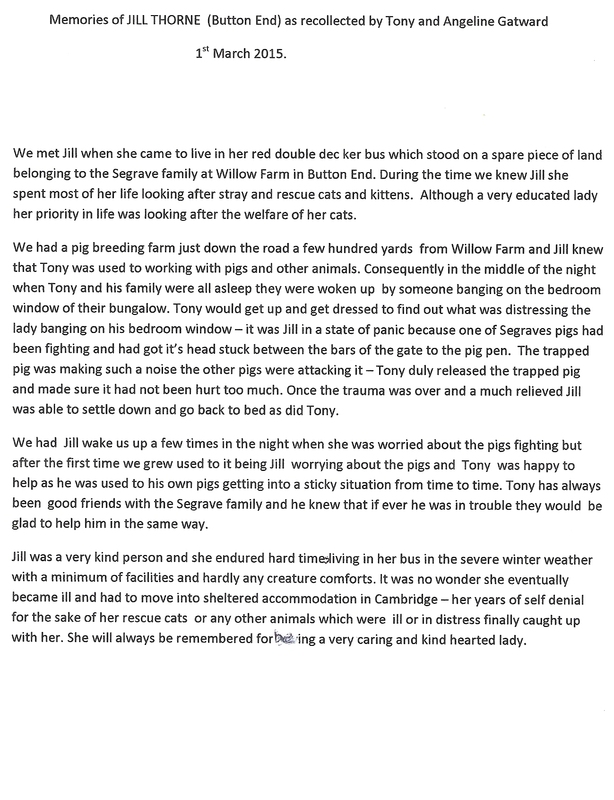 During wartime Tony’s dad had a contract to pick up in a horse and cart all the swill (for pigs?) from the Army based in the village Hall and by the Drift. 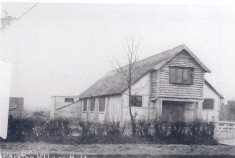 The odd shaped building in the photo behind the village hall could possibly be the army cookhouse. The area where the telephone exchange is was tennis courts and a bowling green and men were camped here in bell tents. Military personnel also lived in Nissan huts in the area where Manor Close and High Meadow now are and on towards the Village Hall. Nearby Mrs Bliss’s house had soldiers in it and it accidentally burnt down but was replaced with the ‘Pest Houses’ built by Pest Control/Fisons for their workers. (Air raid warning sirens were sounded at Fisons). On other side of road was another house for officers. In New Rd was a tin shed behind the Garage which was used for the Pye Unit to make radio parts, later for car repairs. There was also a searchlight base where Queens Close is now. Tony remembers a plane crash in the war. A British plane went down near New Farm (south on road out of village); two of the crew of eight were rescued. They went from school to look at the wreckage. Tony watched planes dogfighting over land at the top of the Drift and one pilot parachuted out. He also remembers a German plane, probably heading for Duxford, dropping bombs and being pushed into a ditch full of nettles by his father to get out of sight! At this time there was a spy based in the village, thought to be guiding planes into Duxford. A lot of soldiers were looking for him and he was finally caught hiding in pigsties, owned by Tony’s uncle and aunt, between the Manse and The Drift. In the Drift were stationed French Canadians. The concrete base of the guardpost call still be seen in the field near the beginning, near where they washed the lice off the soldiers that they got in the trenches and where the Latrines were a big hole, with 4×2 planks across to sit on. There was a large prisoner of war camp where the M11/A10 roundabout is and Tony remembers many German and Italian prisoners of war working in the fields around the village; they were very friendly and got on well with the locals. Charlie Rogers would drive and pick up POW and drive them out to locations to work, one of which was Micelles orchard at top of Sheepshead Lane. During the war there was an observation post at the top of Newton Hill. This is still there today, on the right as you go towards Newton. It was later developed in the cold war as an observation bunker to be used in the event of a nuclear attack. After the war Tony and Gerald Ives played cricket on the recreation ground which was then opposite Park House. They used to mark out the boundary using a string from one point to draw a circle. Cricket stopped in this field when the present recreation ground was brought into use. The Gatwards can remember when the school field was allotments, The Paddock was glasshouses, and Lawrance Lea was a chicken farm. The land to build Lawrance Lea land was sold for the magnificent sum of £800! This page was added on 29/09/2015.